I am very fortunate to still be celebrating my April 15th birthday! 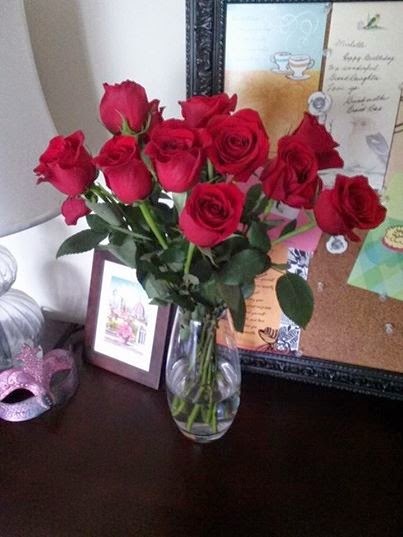 Last Friday evening, my date gave me a beautiful bouquet of red roses, along with a bottle of Merlot and another of champagne before we headed out to dinner in Baltimore. I love them. Red roses are my second favorite flower, only following dark pink azaleas which have just started to bloom now. I arranged them in a clear glass vase and placed them on my desk. They might move from room to room so I can admire them. I adore having fresh flowers in my home.